Honest, hardworking clothing. That's the driving motto behind Arborwear, a rugged outdoor and workwear clothing store headquartered in Chagrin Falls, Ohio. People often ask us which brands and products our treehouse masters love. Arborwear is one of those brands - we've been longtime fans of the company's durable and flexible workwear. Arborwear pants can handle the gnarliest of treehouse builds! Our carpenters are particularly partial to Arborwear's pants. According to Patrick, one of our terrific treehouse carpenters, "Their pants are ridiculously tough! Honestly, they'll get too dirty to wear in public before they'll fall apart." TELL US ABOUT YOUR PATH TO ARBORWEAR. I bought a pair of pants from Arborwear's very first run and had been a fan of the brand since then. I knew that Arborwear was an authentic hometown brand, and I felt good supporting it as a local business. I also could attest to the clothes being both comfortable and bombproof in their ability to last. I knew Arborwear's founders - one day, I ran into Bill [Weber] around town and he encouraged me to join the team. I've been working for Arborwear ever since! WHAT DO YOU LOVE ABOUT ARBORWEAR? I love that we put out honest, hardworking clothes that stand up on a daily basis. We don't follow trends for the sake of being trendy - instead, we focus on making the most durable, comfortable, and high-performance clothing out there. I also love that Arborwear is committed to connecting with our customers - we really care. We want to hear feedback and integrate real-life users' experience. I'd say nine-and-a-half out of ten calls are overwhelmingly positive - it's great to hear people call in to tell us how much they appreciate our products! WHAT DOES IT MEAN WHEN ARBORWEAR SAYS ITS APPAREL IS HONEST? It means that we make a product that we stand behind and that delivers on its promises. We don't just chase the cheapest needle or source the lowest-cost factory, as this would sacrifice the quality of our apparel. Our products are honest because they deliver the highest value possible to customers. And our apparel is ultimately more cost effective for customers, since it's so durable and long-lasting. Arborwear originally started with a purpose to serve arborists. At the time, there were few options for arborist workwear: you had to choose between heavy, restrictive cotton canvas pants or extremely expensive rock climbing clothes. Arborwear decided to change that, combining the flexibility of climbing gear with the durability of traditional workwear. Arborists are still one of our main supporters, but many other types of customers have since taken notice of what we're doing here. From construction workers to outdoorsy folks, we've really grown to serve a diverse community. That said, we still always keep the arborist in mind when we're designing clothing. Arborists have one of the most demanding and harzardous jobs out there, so we trust that a product built to handle arborists' work will perform excellently for those working general construction, or splitting logs, or hiking, or just walking around town. If our products are built for arborists we know they can handle any demand. 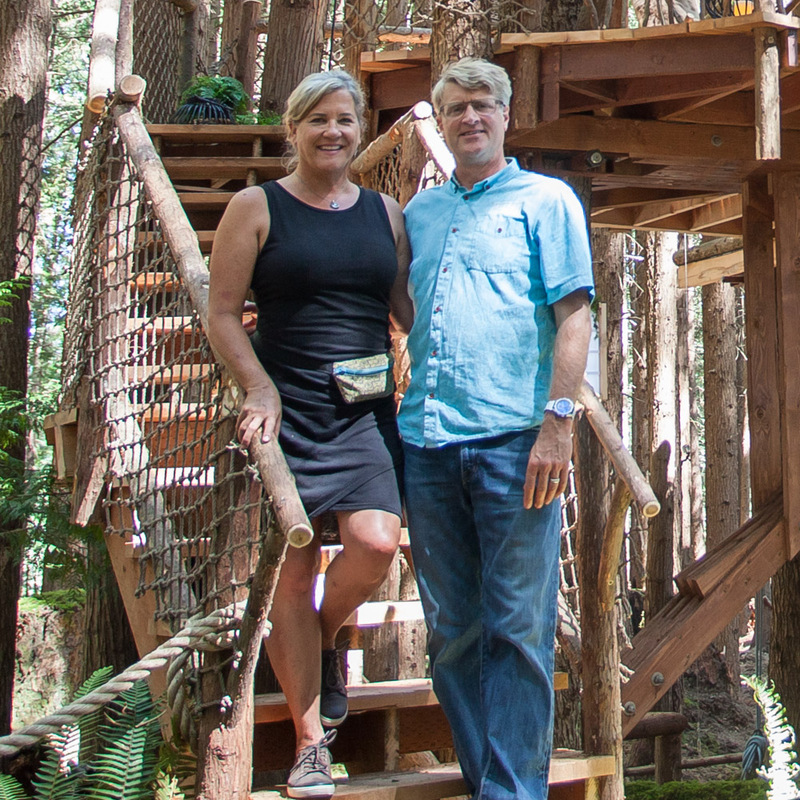 WHY IS ARBORWEAR A GREAT FIT WITH TREEHOUSE BUILDING? The carpenters at Nelson Treehouse represent a perfect combination of our core customers: arborists and general construction workers. Our clothing was designed to handle construction work in the trees! The Nelson Treehouse crew completely gets the importance of having durable, mobile, comfortable clothes that can stand up to the elements. WHAT'S THE TESTING PROCESS LIKE FOR ARBORWEAR CLOTHES? Our clothing goes through two pathways of testing before it makes it through to our customers. First, we have a local group of testers try it out in a real-world setting. They work in it, live in it, play in it, and are very hard on the product to test its durability. Integrating real-life user experiences and feedback into our products is really important to us. Second, we put our clothes through a series of tests in the lab - we'll run sand paper on the pants to record how long it takes to wear out the material, and will put it through stretch tests to ensure that even the thread holds up to movement. MANY ARBORWEAR SHIRTS FEATURE HILARIOUS TAGLINES. WHAT'S THE ROLE OF HUMOR AT ARBORWEAR? We like to give each product it's own lighthearted tagline [you can check out Arborwear's T-Shirt taglines here]. Arborwear has a laid-back nature: we don't take things too seriously, we love to have fun, and we enjoy poking fun at ourselves. We believe we can make hardworking clothing and have fun doing it. I think that's part of what makes Arborwear such a great place to work and has helped us attract talented people and grow. TELL US ABOUT ARBORWEAR'S CONNECTION TO ITS OHIO ROOTS. We've always had a strong connection to our place and beginnings, and are proud to be based in Ohio. I remember when the company consisted of just five or six of us in a cabin, and now we've grown to about 50 people. But all along the way, we've been dedicated to maintaining a family atmosphere and getting out into the surrounding community of Chagrin Falls - we have BBQs together and even go on canoe trips. We also operate our flagship retail store in Chagrin Falls, which is near and dear to us. WHAT'S YOUR FAVORITE ARBORWEAR PRODUCT? My favorite is the cedar flex pants. With their flexibility and durability, they're a great example of how we've combined technology from outdoor apparel brands with heavy-duty workwear. We realized that working people needed more mobility than traditional workwear offered, but they couldn't sacrifice toughness for flex. The cedar flex pants are the solution to those needs. SEANIX: I love that Arbowear pants have extreme mobility and are super durable- all my Arborwear pants still have their crotch intact! I also appreciate that the company has a sense of humor about their work, that they can be a little irreverent. PATRICK: I've been wearing Arborwear from its beginning. My connection to Arborwear initially came through Kerri Gilbert, Arborwear's Wholesale Sales Coordinator. Kerri used to babysit me when I was a kid! She got me hooked on Arborwear, and then I introduced the Nelson Treehouse crew to the company's awesome clothes. I like that Arborwear pants are rugged, made to hold up, and good for climbing. And there are always enough pockets for all my stuff. I even tested a vest for Arborwear and appreciate that their clothes also look good. My favorite product is their pants - they are ridiculously tough! Honestly, they'll get too dirty to wear in public before they'll fall apart. Thanks for sharing Arborwear's story with us, Rob! We hope you've enjoyed learning about a brand we love. To stay up-to-date on all things treehouse, subscribe to our mailing list and follow us on social media.